Saturday was the day! It was the day to find out if I trained enough, if I had it in me, if I wanted it badly enough. It was the day of the 20 mile run. This was going to be the only chance for our group to get this length of a run in before the marathon, and coach Loran says that anything longer takes too long to recover from. So we set out to meet at Nollen Plaza downtown at 7am, with water carriers on bikes riding along with us. It was a small group, Stephanie, Kara, Laura, and myself running with Allison, Julie, and Paul on bikes. That way if we break off because of pace, a rider can go with a runner. So we met at the appropriate time, excited and ready to go, and then . . . Rain. Lots of it. We stood in the rain for a few minutes hoping for a break in the weather, but it was not to be. Undaunted, we decided to reconvene at 3pm and try again. That gave us eight hours to keep the doubts and fears at bay. The skies cleared around noon, and by 3pm it was beautiful! We went over the course once again, and with the riders full of bottled water and our GPS watches set, we took off. The first step was the hardest, knowing that after that first beginning step I would not stop until I crossed 20 miles or until I met with failure . . . whichever came first. Thing was, I didn’t plan on failure even getting a chance to step up. The course map was beautiful! Stephanie did an awesome job of taking us through downtown, through some older neighborhoods, by the Art Center, and into the trails that led us to WaterWorks Park and Gray’s Lake. We then headed back to downtown, the Riverwalk and the Court Avenue district before making it back to the plaza. 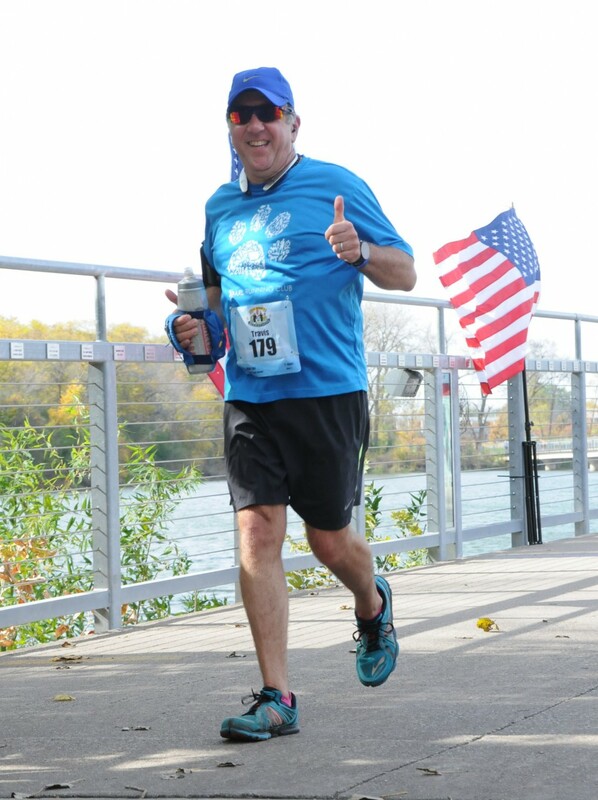 I seemed to be doing ok until about mile 17, when the soreness in my hips and other areas tried to get the best of me. I was closing in on 18 miles, which was my max at the time, and my body was letting me know that. It wanted to stop, to rest, to go home. But then I heard that voice, the one in the Nike commercial that talks about why you’re doing this, and how to keep going. The voice said “Welcome to the grind” and with that I commanded my feet to keep moving, I told the aching muscles to shut up, that I was in charge and that we weren’t finished yet. I was having an internal fight with my body, and my determination was taking control. It was reminding my body that you trained hard for this, that it was now within your grasp, so don’t just let it slip away, to fall back into the well of hopeful dreams and wishes. It’s there, right in front of you, so keep moving toward it. Before I knew it, I was circling the plaza, finishing up the 20 mile run. Sweaty, chilled in the night air, I had to run by an event going on at the Civic Center. Well dressed people stared as I ran by, and I imagine by the way I looked, they were probably worried that I would beg for money. Little did they know that I just received something that money can’t buy; something only earned by training, dedication, sweat, desire, motivation, and the loving support of others. As I passed the last lap, slowed down and stopped my GPS, I looked around and realized I could do anything I wanted to. I just had to be willing to put in the effort to get there. And for that moment, I was there. What a great feeling. After an eventful Saturday (10 mile run in the morning, 5k race in the afternoon) I got up early for the Flapjack 10k. The race is for the Children’s Cancer Connection, and is quite a neat event. This was my first time running the event, and I think it will be on my list of yearly events. A well run event, a good cause, beautiful course along the Raccoon River, and pancakes! Can anyone ask for more? So I got up early and found myself pretty stiff from all running Saturday. Stretching helped, but it would take time to loosen up, and I decided to go to the race with the expectation of finishing, not setting a certain time. It was a perfect morning, and a gorgeous day for an event. I picked up my friend and running partner Kara (I have a few running partners now) and we got to the park. While waiting we ran into Andy (another friend and running partner) and we started chatting about past and future events. Suddenly , a friendly voice from behind said “hello” and there was Jo-el! She and her husband were my trail blazing buddies from the ARL Dog Jog yesterday! It seems she remembered me mentioning the flapjack event, and decided to join us for the 5k portion! So after introductions were made, we headed up to the start line. I think I did ok, even with tired and sore legs. I didn’t seem to loosen up until mile four, and that makes it hard to feel like you’re doing decently with that going on. I finished the 10k in 56:28, way behind Kara and Andy, but happy to cross the finish line. Jo-el finished her 5k with a great time and then we sat down to a pancake and sausage breakfast. Poor Andy had to skip breakfast and head to work, but it was great that we all got together on a beautiful Sunday morning. So all in all a great day! Friends both old and new, a beautiful morning, a fun run, and pancakes! A great way to start anyone’s day! Below are pictures of Jo-el, Kara, and myself at the event. After a beautiful morning and a ten mile run, I got some errands done and then got ready for the Animal Rescue League’s 1st annual Dog Jog. It was a nice afternoon for a second run, and for a good cause. Being a 1st time event, there are always bumps in the road. This one suffered from the lack of signage to keep runners on the right track. At one point, I ran back to the couple behind me to see if they knew where to go. They laughed and said “We’re following you”. So we decided to blaze our own trail and hope for the best. We ended up chatting and laughing as we wound our way through downtown. When we were coming on to the finish, we noticed that we were coming in from the wrong way! Somehow we got turned around and ran a little further than we needed to. The neat thing was as we crossed the line, we did it together at the same time. We finished our adventure as a team! As we were talking to the race director (who was interested in how we got turned around and asked for tips to make next year better) we found out we were the first to finish! The three of us won the inaugural Dog Jog. So to sum up the evening, I ran the 5k in 26:38 after running 10 miles in the morning, made two new friends, and won the first ever Dog Jog along with my fellow adventurers. A great evening all around. I will definitely do the event next year! Good morning and happy weekend! My weekend got off to a wonderful start as our running group met at 7am to get a 10 mile run in. My good friend Stephanie and I ran together, and what a beautiful morning for a run. The sun was peeking through the trees, there was a slight mist in the air, and if you looked close, you could see your breath. The trail was clear, which was amazing after the storms we have had recently. A big thank you to the Parks and Recreation Dept. for getting the trails open so quickly! So we took off and before you knew it, we were at the turnaround point! Then it was time to head for home, after we got a few stretching tips first! That’s what I really like about the ICan Running Group; they work with you and each other to help each other be successful. Whether it’s healthy eating, stretching, training, supplements, or just encouragement, someone in the club has tips or advice or has been down the road you are currently on. Those things are priceless, no matter your experience level. My foam roller stretches are complete, so its time to eat a little and relax before the Dog Jog this afternoon. The Animal Rescue League is holding a 5k event downtown to raise money and awareness for homeless animals. Since both my dogs are rescue dogs, it only seemed right to run in this one. I even belong to their running club! It’s a timed event, but since I got 10 in this morning, I am not too concerned about the time. I just want to be there. Sunday is another running day: the Flapjack 10k is in the morning, and I will run with my friend Kara. She needs to get 9 miles in for her half marathon training, so we plan on running the 10k, crossing the finish line, turn around and run another 5k. That should confuse everyone! 🙂 Then we get free pancakes and the chance to gain back all the calories we lost! That’s it for now. Have a great weekend and get out and enjoy life. Happy Sunday Funday everyone! I started this Sunday out with a nice 10 mile run with my friend Stephanie. I love running with her because we chat about life, training, events, and whatever else pops up as we run. I’m always amazed on how fast the time flies. She is just a great person and such a positive supportive influence to be around. One of the things that we do talk about while running is training. She has a wealth of knowledge on fitness, since she has been at this lifestyle longer than I have, and has a lot more resources available to her. Today, we discussed sprint training and incorporating it into the medium runs to help build strength and endurance. We agreed that after 9 miles, we would sprint for 20 seconds and jog for 40 seconds. We would repeat the process 10 times. And Stephanie left me in the dust. The 40 seconds went by quick, because by the time I was close to recovering it was sprint time again! But towards the end I was able to keep up and didn’t feel so tired we finished mile ten. I am so grateful for all the positive friends that I have in my life now. Helpful, fun, like minded, encouraging, and supportive, these friends are my ‘support group.’ They are always there cheering me on and helping me to reach my goals. I could never thank them enough! Minimalist Running – Is It For You? I wear Vibram Five Fingers when I run. I love the feel of the road, the ability to move my toes, and the fact that since I started wearing Vibram’s, I don’t get shin splints! But, as great as I think they are, they didn’t become my favorite running shoe without some hard lessons to learn. First, don’t expect to take a minimalist shoe out of the box and run ten miles if they are your first pair. I made that mistake, because they felt so good. I went out on a three mile run, and it felt so good that I went five miles. At the time, five miles was my max. I was so proud of myself, until the muscles in my legs started to tighten to the point that it looked like I was posing for Muscle and Fitness magazine. I could barely walk! I went back to the running store and talked to an expert who told me how to get used to minimalist shoes; taking it slow and letting the muscles stretch and the new muscles that you are starting to use adjust to their new role in your running program. It took a little bit, but I think it was worth it. I have a half marathon under my belt in them, and hopefully a full marathon next month. Second, you will change how your foot hits the ground. I was always a ‘heel strike’ runner, but now I land more to the center of the foot. It’s as if I am running barefoot, but with protection from road debris. It helps explain the minimalist running movement and may help you decide if you want to try them. We called her barefoot Bonnie. She showed up at a training run in Earth Shoes and clobbered most of the guys. Then she ditched even that minimal footwear for a summer on the track, beating several of the local elites. At the time, less than two years ago, most people didn’t even know it was permitted to race without shoes. Today, we’re in a minimalist running craze. The untraditionally shod are, if not everywhere, vociferous enough that they certainly seem to be. Is there anything actually to it, or is it just noise, inspired by Born to Run, Christopher McDougall’s New York Times bestseller about the sandal-wearing ultramarathoners among Mexico’s Tarahumara Indians? Away from the hype and the extremes, the minimalist movement is rightly correcting decades of drifting in the other direction when it comes to running shoe design. At its core, minimalism asks the runner to look for the least amount of shoe he or she can safely wear now, and to work toward reducing the amount of shoe necessary through strengthening the foot and improving one’s stride. It assumes that running is a natural movement of the body, rather than an unnatural act that requires pads and braces to perform safely. Putting it plainly, the movement embraces the notion that the beefier the shoe, the more a runner’s natural stride is inhibited. In fact, Murphy says, we may be on the verge of a sea change similar to the one that spawned today’s “traditional” shoe in the late 1970s and early ’80s. Suddenly, many shoes looked more or less alike: lots of heel lift, lots of cushioning, and, for runners who needed stability, beefy protection against excess pronation. The shoes, in other words, that most of us have been wearing for the last 25 years. Minimalist runners have a number of complaints about modern shoes. They argue that the more material added under the foot — foam, rubber, plastic, air bags, gel packets — the less a runner’s feet can “feel” the ground and the less a runner can utilize the afferent feedback gained from the foot-ground interaction. “It’s like a gymnast landing on a mat that’s too soft,” says Michael Sandler, who coaches barefoot running in Boulder, Colo. “Or like trying to play the piano in heavily cushioned gloves.” The need to make firm, fully controlled contact with the ground, he argues, means that softer heels require you to come down harder than you would in less cushioned footwear. Portland podiatrist McClanahan agrees. In addition to heel lift, McClanahan has two main beefs with traditional shoe design. One is the narrow toe box, which he believes pinches toes too close together. The other is “toe spring,” in which shoes turn upward at the toes by as much as 30 degrees. Whatever the cause, everyone agrees that shoes radically change the way most people run. Just to start with, barefoot runners don’t heel strike. “It hurts,” Sandler says. Instead, unshod runners or those wearing very minimalist footwear will tend to land on their midfoot, at the ball of the foot. BUT WILL IT MAKE ME FASTER? For serious competitors, most of this is meaningless if we don’t know its effect on performance. Years ago, South Africa’s Zola Budd ran world-class times barefoot. And my club’s Barefoot Bonnie could easily produce a sub-18:00 5K. But were they fast because they ran barefoot? Or would they have been fast, regardless, and being fast and efficient allowed them to run barefoot? But evidence is starting to come in. A 2007 study in the Journal of Strength Conditioning Research showed that foot motion and performance are definitely linked. Hiroshi Hasegawa and colleagues from Ryukoku University in Kyoto, Japan, videotaped 283 elite runners at the 15K mark of the 2004 Sapporo International Half Marathon. Even among the elites, they discovered, nearly three-quarters landed on their heels. But the fraction was reduced to 62 percent among those running faster than 4:55 miles. The front of the pack also had reduced contact times — the interval in which the foot touches the ground, each stride. And heel strikers’ contact times were nearly 10 percent longer than forefoot or midfoot strikers’, again suggesting that heel striking might slow you down and that barefoot-mimicking minimalist footwear might speed you up. It certainly fits barefoot-running theory, which argues that the barefoot style not only puts you up on your midfoot, but leads you to run with a lighter, springier stride, translating to reduced contact time. But again, this isn’t concrete proof. Perhaps landing on the forefoot is simply a side effect of going faster. Jack Daniels, author of Daniels’ Running Formula, is a coach and exercise physiologist who sometimes runs barefoot on tracks near his Flagstaff, Ariz., home. Some years ago, he conducted studies (never published) on the effects of footwear on oxygen demand. The results were limited but they too suggest that minimal footwear is better. But they also found that skimpier designs increase performance … to a point. After that, cutting down the shoe not only failed to reduce the aerobic “cost,” but minimalist shoes actually became less efficient. And what of the unparalleled East African runners, who reputedly develop their perfect strides running barefoot to school? Why are shoes one of the first purchases African runners make once they can afford them? “[In Kenya,] only children are running barefoot, and indeed only because they don’t have the money to buy shoes,” Pieter Langerhorst, husband and agent of Kenyan-born worldrecord holder Lornah Kiplagat, said by email. But, he adds, that doesn’t mean the top runners have totally abandoned barefoot running. After track workouts, they often take barefoot cooldowns on the grass of the infield. “This keeps the muscles in the feet also eager,” Langerhorst wrote in his Dutch-flavored English. Many top Western runners also run barefoot strides for similar reasons, even if they didn’t grow up unshod. Or consider Ethiopia’s Abebe Bikila, who ran b arefoot through the streets of Rome in the 1960 Olympics, setting a world-record 2:15:17 marathon. Score one for barefoot running. But four years later he was back, this time in shoes, albeit a pair of Pumas that, typical of the era, were lightweight and minimally constructed. The result, another world record, 3 minutes faster: 2:12:12. Was he simply in better shape? Or was it the shoes? In addition to possible skin damage, one must consider the hardness of the surface. Kenyan kids don’t run on concrete sidewalks, but soft dirt roads and trails with a similar under-foot feel as Daniels’ cushioned track. In other words, less is more … but only to a point. And nobody’s really sure yet where that point lies. Most likely, it’s an individual decision, ranging from Bonnie in her bare feet to someone whose Brooks Beasts are doing their job perfectly and who has every reason not to change. Most runners are not going to want to go all the way to barefoot running, or to barefootsimulating shoes like the Vibram FiveFingers or Terra Plana EVO Barefoot. For them, minimalism will mean something less radical. Shoe companies are scrambling to get into the act of producing scientifically designed “moderate” alternatives. First, though, they have to figure out precisely how shoe design affects running style. Obviously, it’s not the simple fact of having something on your feet that makes the difference. Runners using the Vibram FiveFingers run barefoot style, even though it is technically a shoe (albeit a very stripped-down one). Presumably, the difference lies in the thickness of the cushioning and the geometry of the heel. There would seem to be a point at which, with reduced cushion and heel design, a standard shoe begins to behave more like a FiveFingers. “If you start with a thick shoe and slowly whittle down,” Murphy asks, “at what point does the person start to run like they’re barefoot? We’ve completed those studies,” he adds, “and come up with some pretty solid lines of thinking on how you make the foot work as naturally as possible, and at the same time protect [it] from the elements.” Expect to see the results in early 2011, joining a slew of new designs that have emerged in recent years from companies old and new to meet the minimalist demand. Even with today’s options, the choice is far more complex than “to bare or not to bare.” “People are trying to separate this into ‘no shoes’ [vs.] ‘motion-control shoes,’ whereas there is a whole bunch in between,” says Mark Plaatjes, a physical therapist and co-owner of Colorado’s Boulder Running Company. Who shouldn’t do it? Diabetics, to begin with. “They don’t feel their feet,” McClanahan says. “They’re going to damage their joints.” Also on McClanahan’s don’t-try-it list are people with rheumatoid arthritis or otherwise abnormal feet. Sandler includes people with bones that didn’t heal properly from a break. Plaatjes believes there’s only one way to figure out which group you belong in. “You really have to have somebody look at you and give an opinion as to whether this is really an option for you,” he says. And in doing this, he adds, don’t automatically presume that running stores are out to sell you the beefiest shoe they can convince you to buy. Finally, if you do decide to shift to a more minimalist shoe, caution should be your watchword. While there’s not yet a lot of coaching experience with minimalism, a standard coaching rule is not to jump into anything too quickly. “It took me a year to get fully accustomed to my Vibram FiveFingers,” adds McClanahan. So, start easy, both in how far you move away from the shoes you’ve been running in, and how long you spend in more minimal footwear. Working new muscles to strengthen them is what we do as runners. Moving to a less supportive shoe will likely reveal core and hip weakness as well, and require work to strengthen these. Ultimately, the minimalist goal is to run better — more naturally, more efficiently, with less impact — making us less prone to injury, so we can run longer, and faster. It’s not about the shoes. Today was race day. Usually on Saturday I get my long run in, but today was different. I signed up for a 5k race in my neighborhood. It’s only two miles away, so I figured instead of driving to the race, I’d run there. So I took off and ran the two miles to the race in 18 min. Not too bad so far. Then came the race. Finished with a PR of 24:12!! I was under 8 mins a mile! It felt great! I cooled down and chatted with friends both old and new, and then took off for home. It was a little slower 9:29 pace, but for a quick run, then a quick race, I’ll take an extra :30 per mile average. It was a great morning. Here’s hoping everyone out there has a great weekend! Oh, and the new Vibram’s felt great! Just a quick note before heading out to the Beaverdale Beaverdash 5k. Check your shoes often for signs of wear and tear. I was running the other day, and during the run the big toe on both feet was hurting. I thought it was odd, but after four miles I stopped running and walked home. Now, I wear Vibrams (the five fingered shoe) so there is not much material to start with. Anyway, I had holes in both toes. No wonder they hurt! So be sure to inspect the one piece of equipment you need to run; your shoes. I probably have 300+ miles on them, a half marathon, a 20k, numerous 5k races, and countless training hours. Rest well dear shoes, you’ve earned it. (Maybe I should get them bronzed). Today was my long run day. In the past that meant that I went out on my own and ran wherever the road led and wherever I felt like going. But for the last couple of weeks, I have been meeting up with my friends Stephanie, Kara, and the ICan marathon group and completing my long runs with friends. The ICan group is a group that are preparing for their first full or half marathon. Led by Coach Loran Storts, we lengthen our runs in preparation for the marathon. Coach Loran also gives out fitness advice, suggestions to remember on race day, after run stretching and activity tips, and even brought along a case of water so we could keep hydrated. He rides back and forth on his bicycle since the group usually splinters into smaller groups due to running speed. And, believe it or not, he does this all for free! He does have a training center, Ironworks, that helps with triathlon training. Trust me, you should check him out! Now back to today’s run. Coach Loran had us meet in the east village at 6am. The early start was due to the potential heat we would be suffering through today. His hope was that we would finish before it got miserably hot. He had us meet in the village instead of our usual bike trail for a reason: He wanted us to run the hills on the actual marathon route! Now, I thought I had done some hill training, by running downtown on a regular basis, but I was not prepared for this! These hills are steep for being in Des Moines (South of Grand Area), and as one hill ended it seemed that another began! It was brutal, and as we came out of the area we were congratulating each other on a job well done. I can see the logic in Coach Loran’s thinking. Now we know what we are up against. Now we’ve seen what the marathon will throw at us, and we will not be surprised. Now we know how and where to run to get the hill practice in. When race day arrives, we will not be in the group of runners that say “Oh my God” and stop and walk up the hills. This happened at the Drake/Hy Vee half marathon, and I was almost one of them. But, because of stubbornness and training, I powered through those hills quite like I powered through these today. It also showed me that even though I thought I was doing hill training, I should look up the course route ahead of time and see where I am going and train appropriately. We ran back downtown, then to Gray’s Lake, and finally back to the start. When it was over, I logged in 18.02 miles and over 2000 calories burned. I also learned that having friends around you makes the challenges of life (or running) easier to deal with. We talked and laughed our way through the hills, and come race day, those happy memories will return once more to help me get past them again. Tomorrow will be a rest/recovery day. Maybe something light like a walk or swimming. 18 mile boundary is now a thing of the past. The 20 mile boundary cannot be too far behind. Just a quick update. I went on a 22.5 mile bike ride today, and was involved in a wreck in the first three miles. Other than a scarred elbow and shoulder, and damage to the bike (more like battle scars) I’m ok. My wife has some scratches and some pretty sore ribs. While it was a little scary and a little embarrassing, it was the kindness of strangers that made the entire trip worthwhile. Immediately after we crashed, we had a couple of bicyclists that stopped and offered assistance. They helped us find everything that flew around during the crash, and even offered the use of their cell phones to call for help. After we assured them that we were ok, they wished us luck and rode off with a smile. We started again, and I discovered that my bike wasn’t shifting properly. I stopped again to see what was the problem when another bicyclist approached us. He jokingly said “It’s never a good sign when a bike is upside down.” He then assisted me in adjusting the gear cables, and I was good to go. Without the help of these three people, my ride would have been cut extremely short. I do not know who these people are, but I owe them a huge thank you for stopping what they were doing and helping me. It seems that bicyclists are that way: they help one another and make sure that their fellow bicyclists are ok. I hope that someday if the time comes, I will be able to help someone else in need. Wouldn’t it be nice if we all lived this way all the time? That we would always help one another, no matter what? I think that’s the goal we should all be aiming for. So, at the end of the day, I ran 8 miles and rode 22.5 miles. I also felt the kindness of strangers and the unity of friends. All told, even with the skin loss, it was a positive day.